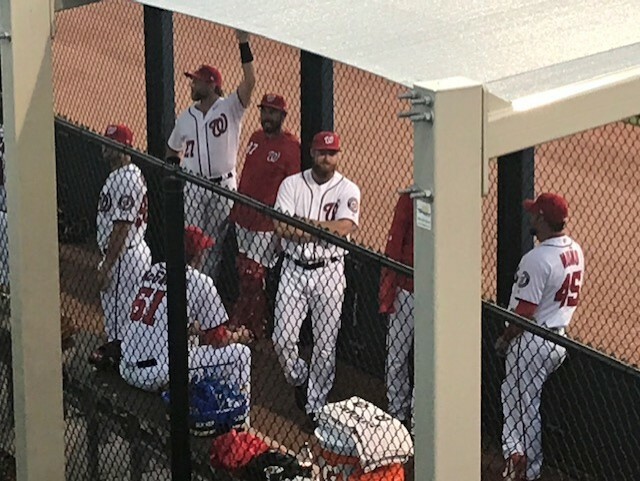 The Nationals had a 5-3 lead in the 8th inning after Anthony Rendon homered and Wilmer Difo crushed a 2-run home run into the upper deck in Citifield, but then the Nats bullpen in the bottom of the 8th inning self-destructed. Justin Miller got no help from the umpire and gave up 2 solo home runs and Tony Sipp never retired a batter leading to the winning run and a disappointing 6-5 loss. The Nationals never gave up in this game, and the offense along with great baserunning and defense kept the Nats in this game but another blown save and loss in the bullpen just has to frustrate the Nationals who should have sewn up a nice road win instead of a 1-run loss. 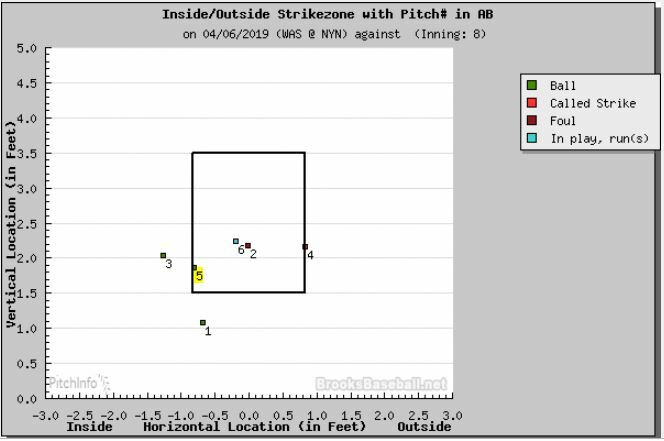 For Justin Miller, he went from the shining star of the bullpen with a 0.00 ERA to just another reliever who threw some poorly placed balls today, but the umpire also did not help matters if you look at the chart below. Miller had Robinson Cano frozen on pitch #5 and catcher Yan Gomes presented the ball which did not even need to be framed. Miller threw the next pitch in frustration right over the plate and Cano did not miss it for a long home run and a blown save. For Tony Sipp, he could not get out either left-handed batter he faced today. The Nationals scored runs the conventional way today, but also scored a run on a wild pitch that Victor Robles scored from second base after catcher Wilson Ramos could not locate the baseball. Today’s starter, Patrick Corbin went 6.0 full innings and gave up 3-runs. He was absolutely cruising into the 6th inning when he made two consecutive bad pitches that were hit out for home runs. Onto tomorrow for this series finale.